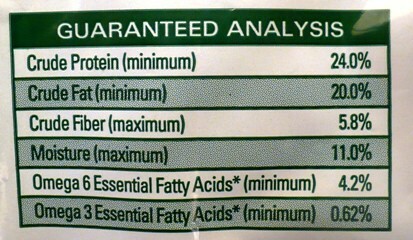 The guaranteed analysis can be found on the information panel of a pet food label. 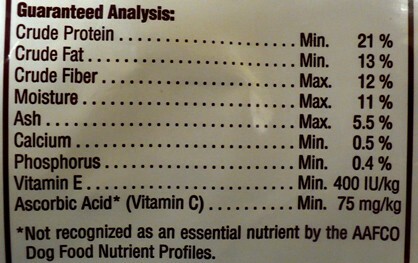 This portion of the label provides the nutrient composition of the diet. It is required to include the minimum percentage of crude protein and crude fat as well as the maximum percentage of crude fiber and moisture. The “crude” term indicates that the methods for determining nutrient concentrations provide a rough estimate of quantity; it does not refer to the quality of the nutrients themselves. Protein, fat, fiber, and moisture (water) are the only nutrients that the manufacturer must include in the guaranteed analysis, although sometimes other nutrients such as calcium and phosphorus for dogs or taurine and ash for cats are provided. Nutrient values are provided on an “as is” basis, meaning that the percentage is based on the current form of the diet. The “as is” nutrient concentrations will be higher in dry pet foods compared to canned foods. This occurs because the majority (approximately 78 to 82%) of a canned food is water, so the nutrients are more diluted than in a dry food (approximately 10 to 12% moisture). For a more accurate comparison of nutrient content, diets should be compared on a dry matter basis (with all the moisture removed). This can be done by dividing the nutrient concentration by the dry matter concentration and multiplying by 100. A general rule is to multiply the canned food concentrations by four to five to get a rough estimate to compare to a dry food. The fact that a canned diet is predominately moisture will result in the need to feed a higher volume of that food each day to meet the animal’s nutrient needs. For an adult dog at maintenance, AAFCO (Association of American Feed Control Officials) guidelines set a minimum protein percentage at 22 and fat at 5 on a dry matter basis. For an adult cat, the minimum protein percentage is 26 and fat is 9 on a dry matter basis. The values of the guaranteed analysis should be at or above these required levels. Many commercial diets will include much higher fat concentrations to improve the taste of the product to the animal. The exceptions to this would include clinical or veterinary diets where a low protein or fat content would be warranted to prevent or treat disease symptoms. In addition, weight-loss diets often include lower fat concentrations.